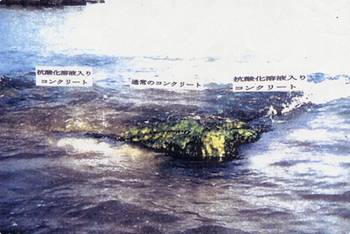 The picture to the left was taken on July, 2004. 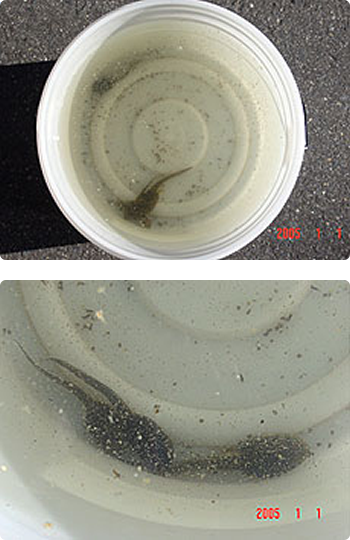 These tadpoles were caught in a river in Osaka, Japan and were raised in the Iki-Iki Pail, an Anti Oxidant Solution mixed bucket filled tap water. As you can see on the picture to the right (taken on January, 2005), they are still tadpoles. The tadpoles are still the same as of April, 2005. Why didn’t the tadpoles transform? This is an example of the effects caused by the Anti Oxidant Solution and the Anti Oxidant Construction Method. The observed effects are beyond contemporary science. Before you begin to understand what the Anti Oxidant Solution is, please try to accept these seemingly improbable evidences. These evidences point to why the Anti Oxidant Solution and Anti Oxidant Construction Method are effective against various ailments. When you fill water into the Iki-Iki Pail, an Anti Oxidant Solution mixed bucket, active oxygen in the water will be eliminated. For tadpoles to become frogs, growth hormones must be stimulated by active oxygen. In the Iki-Iki Pail, active oxygen is eliminated; hence the process of growth is delayed. What is the purpose of active oxygen for human beings? 10 billion active oxygen particles are generated in a person’ body daily. Leukocyte cells take advantage of the characteristics of active oxygen to kill the bacterial invaders in the body by oxidizing them. The excess active oxygen from this activity will be eliminated by the SOD enzyme, if the body is functioning properly. However, the human body’s ability to generating the SOD enzyme is reduced from around age 20 and is hardly able to generate it at around age 40. Active oxygen remaining in the body causes oxidization of nucleic acids (a component of DNA) and alters them to become cancer cells. The remaining active oxygen also oxidizes unsaturated fatty acid in cell membranes and alters to lipoperoxide then destroys cells and tissues. It is thought that 80-90% of acknowledged diseases are caused by active oxygen. As evidenced in the photographs of the tadpoles, living in a house built with the Anti Oxidant Construction Method, or using Anti Oxidant Solution adopted products may be effective against various diseases. There are many people who continue to struggle with diseases even under the care of doctors. Please try our products and judge for yourself the effectiveness of the Anti Oxidant Solution. Kouichi Sasada, President and representative director of Aida Laboratories Co., Ltd. 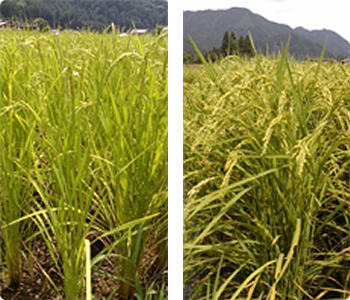 The picture on the left is a normal stalk of rice and the picture on the right is a stalk of rice grown using Anti Oxidant Solution adopted products as substitution for fertilizer.It is very evident that the stalk on the right is fuller than the one on the left. 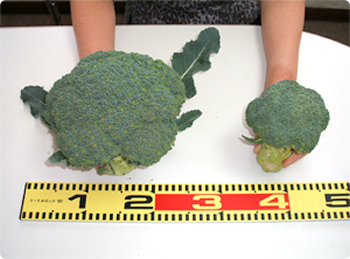 The broccoli on the left was grown using Anti Oxidant Solution adopted products as substitution for fertilizer. The broccoli has grown larger than those on the market and has better taste. 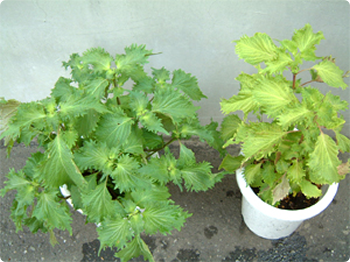 The shiso leaf on the left was grown using Anti Oxidant Solution adopted products as substitution for fertilizer. This shiso leaf has grown much bigger than a normally grown shiso leaf . 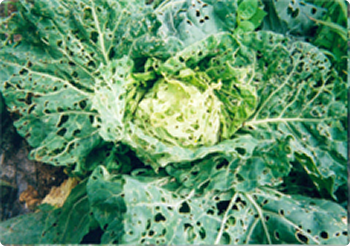 The upper picture,Cabbage suffering from unknown diseases and bugs. 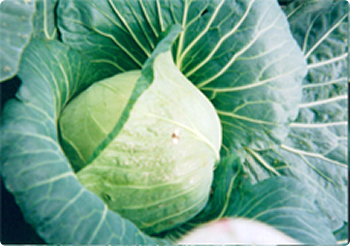 The lower picture,Cabbage grown using the Anti Oxidant Solution sprayed in the field. It became a top quality cabbage. Liquid fertilizer rotting, terrible stench and flies. 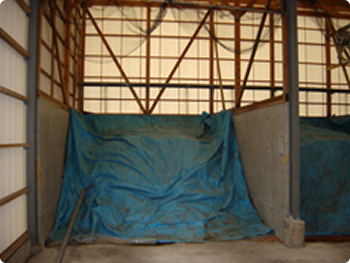 After renovating the waste treatment plant using the Anti Oxidant Construction Method, flies are barely seen in the area. Before renovation, there was a terrible stench and a mass of flies. Although there is still a faint smell in the area, the smell has changed from a rotting smell to a smell of good fermentation. It is a dramatic change from before. Swallows made their nests in this new building. Swallows don’t normally build nests in new buildings. 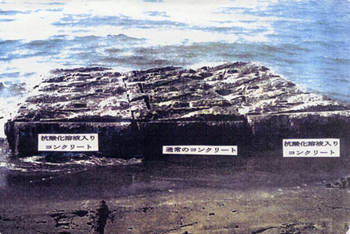 On October 28th, 2002, We installed a concrete plate made with the Anti Oxidant Solution in the sea near a fishing port in Hokkaido, Japan. There were barely any species present when we installed the plate. 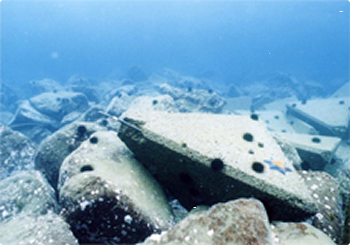 As of May 27th, 2003 (above picture), we observed sea urchins and starfishes breeding around the concrete plate. 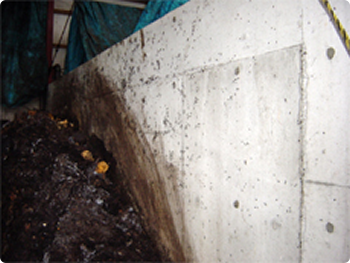 Observe the picture on the top.We installed ordinary concrete and Anti Oxidant Solution mixed concrete on the coast. The middle one ordinary concrete plate and on both sides are the Anti Oxidant Solution mixed concrete. Observe the picture on the bottom.Water plants grew on the Anti Oxidant Solution mixed concrete plates while nothing has grown on the ordinary concrete plate.